Nearly fifteen years ago, I took over a direct marketing team at the online division at Nordstrom. This was not a high performing team, by any definition. Employees did not like each other, employees did not work hard, and quality of work was very poor. Interestingly, I inherited a dozen or so vendors. I had worked with many of the vendors previously. In fact, many of the employees working for my vendors were employees I worked with at other companies. These individuals performed really, really well when supporting me in the past. But when asked to support the division of a company with poor leadership, well, these individuals performed poorly. It became obvious that I needed a process to hold my vendor team accountable. I scheduled a meeting, and asked all of my key vendor partners to attend. The vendors paid their own airfare and hotel expenses. I paid for a dinner after the meeting concluded. In this day-long meeting, I clearly spelled out my goals and objectives for the year. I was very honest, and I was very direct. 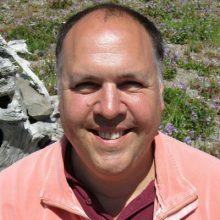 I shared profit objectives, sales objectives, expense objectives, and cost per new customer goals. I made it clear that if I did not fix my department, and if I did not fix company profit difficulties, I would lose my job. As a consequence, then, my vendors had to perform extremely well, or they would no longer support my company. Almost immediately, the performance of my vendor team improved. The difference in performance was impressive. Suddenly, my vendor partners cared about my business, and were working hard to deliver sales and profit improvements. A handful of vendors did not perform well. These vendors simply didn’t care about my goals, were not capable of supporting my objectives, or did not understand how important their performance was to my team, and to my company. Those vendor relationships ended swiftly, sending a message to my department, my boss, and my vendor partners that I was serious about holding vendors accountable for performance. In recent months, I noticed many similar (and disturbing) trends between my client base and the vendors who support my client base. My clients have clear needs, and in so many cases, the vendors they outsource marketing activities to have opposing goals, or the vendor simply doesn’t care about what my clients are trying to accomplish. 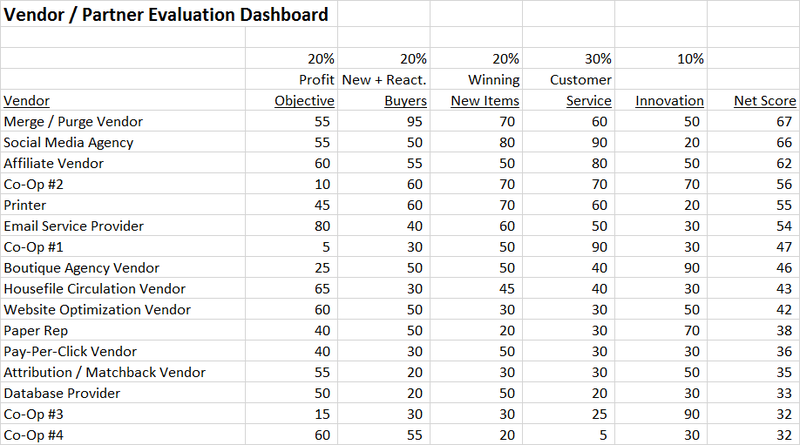 To simplify the communication process for my client base, I created the Vendor / Partner Evaluation Dashboard. Here is a sample. In this dashboard, each vendor is evaluated (monthly) on a 0-to-100 scale (100 = good, 0 = not good). Each of my objectives are ranked in importance. By multiplying each score by each weighting, we are able to rank-order each vendor . Each vendor can see where the vendor stands in comparison to other vendors, without giving up too much proprietary information. Look at the Database Provider row. This vendor houses the customer database for a client. This vendor is not helping my client increase new + reactivated buyers, this vendor is not providing great customer service, and this vendor is not innovating. As a result, the Database Provider earns a score of thirty-three (33). This vendor is at the bottom of the table. By quantifying the performance of each vendor (and sharing the quantification with each vendor, monthly), my clients are able to clearly communicate to each vendor where performance must improve. After reviewing the table, the vendor has to make a choice. The vendor can work hard to improve performance, or the vendor can choose not to improve performance. If the vendor chooses to not improve performance, then the client has one of two choices. 2. Find a new vendor. I encourage clients to find a new vendor, when performance does not meet expectations. I encourage clients to carefully evaluate the three or four vendors at the bottom of the table. All of the vendors need to see that they will be held accountable if performance slides. It has been my experience that when a client is willing to make changes, and all vendors know that the changes are made, then all vendors work harder to improve overall performance. This process is beneficial to both clients and vendors. Clients earn more profit, allowing clients to spend more on marketing activities. Vendors benefit by increased spend, but more important, vendors benefit because vendor efforts improve, and those improvements can be used across the entire vendor client base. This does not have to be a mean-spirited process. Instead, the process needs to be fully explained, with full transparency, honesty, and with clear communication. If the client can accomplish this task, the client has an opportunity to have significantly improved relationships with vendors. Sales and profit increases are most certainly attainable under this model.